A lot of the photography I like to focus on is moving water. Not only does it capture what the human eye doesn’t normally see, there is so much variety in what you can capture. For me, it adds a surreal element to my images that I crave. So, how do we do it? Waterfalls are amazing for this effect - but they're not the only thing you can shoot with slow shutter speeds! When you take a photo, your camera’s shutter opens and closes. Your shutter speed setting will determine how long the shutter is kept open before closing. Whatever your camera sees while the shutter is open is what becomes your photo. By using slower shutter speeds, the shutter will open for longer and therefore capture more. All motion is captured during an exposure, so a slow shutter (i.e. a long exposure) will capture the blur of the moving water and make it look silky. It’s 100% your shutter speed. Different shutter speeds will give you different effects. This is the fun part! You can completely change the way your water looks by changing your shutter speed. A 1-second exposure will have a lot of action and detail, compared to the relaxing look of a 30-second exposure. This is where you should experiment and see what look you prefer. You would be surprised how the slightest change to your shutter speed changes the dynamic of your scene. Different water will give you different results. Having said the above, your water source also plays a big role. Oceans will look different to waterfalls. A strong surge of water will look different to a calm body. This is why there is no “one size fits all” setting. I’d be lying through my teeth if I said a 30-second shutter speed will give you the same result no matter what you’re photographing. This is where experimenting is your friend. Always try different settings at different locations to see what the scene can offer. Depending on the flow, most waterfalls look their best with an 8-second exposure or longer. 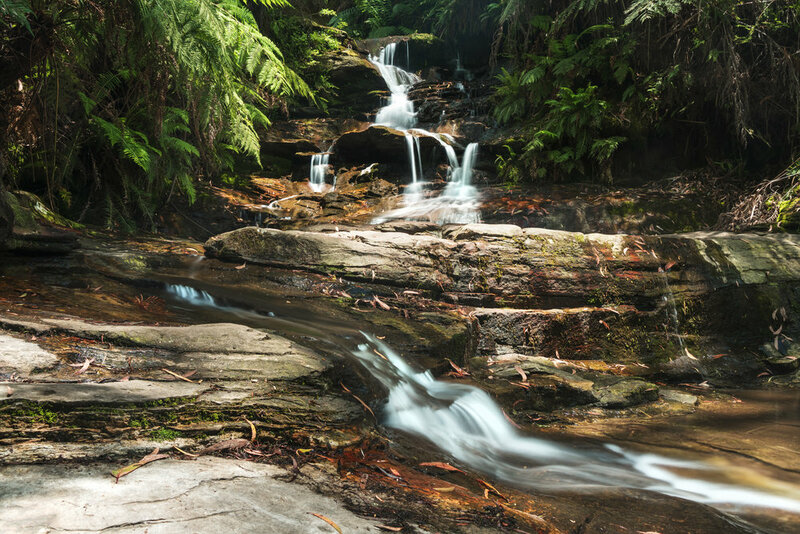 At a certain point the length of your exposure won’t change the look of your water flow. What I mean by this is that the water flow in a 13-second exposure won’t be much different from that of a 30-second exposure. What will be affected is the body of water the waterfall is hitting – the longer your exposure, the smoother this body of water will be. Experiment with shutter speeds between 1/4 of a second and 30 seconds. The great thing about beaches/oceans is there’s so much variety. If you get huge crashing waves and want an action-filled shot, try 1/4 of a second. If you get lovely sweeping waves on the sand, try 1 second. If you want a misty effect, try 30 seconds. Still bodies of water look incredible at 10 seconds or longer. Just like those waterfall bodies, the longer the exposure means the smoother the water. If you use a fast shutter speed, you’ll be able to see all of the ripples on the water – it’s up to you to find out what you like. This is where ND filters come in super handy – they will reduce the amount of light hitting your sensor and allow you to use slower shutter speeds without overexposing. Tip: Keep an eye on your histogram at all times. Because your shutter is open for longer, any moving object will have blur. For water, this is exactly what we want. But for things like trees blowing in the wind and birds/people moving through the frame, these will also become blurry. Is this really a problem? Up to you. Some big-name photographers share photos with blurry trees/animals, others won’t. If it bothers you, there’s 2 options: either wait for all wind/motion to stop, or stack your images. What this means is using a slow shutter for the water, and use a fast shutter for everything else, and blend the images together in the editing room later. Tip: Take a lot of shots to keep your options open. Depending on how close you are to the water, just be wary that you may start to get water droplets on your lens or filters. This isn’t a big deal, and most spots like this can be fixed in editing, but it’s something to check for between shots. Too many water drops could start to become a problem. Tip: Use a lens cloth to clean your lens/filters between shots. Really, just like any other type of photography, it all comes down to experimenting and practice. Find out what shutter speeds give you the effects that you want. Shoot different types of water learn how different motion looks with shutter speeds. Or just go with the flow!